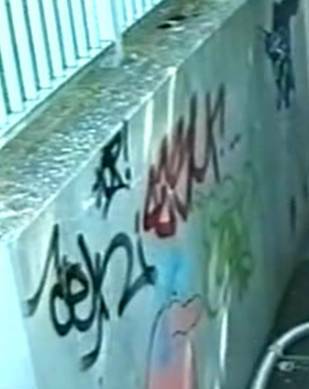 Clean Break can remove graffiti from any surface including – brick, stone, concrete, wood, glass and plastic. We provide a nationwide service with a rapid response service unit ready to clean your graffiti off quickly and professionally. To provide such a service we use the latest steam cleaning equipment. We can even remove the unsightly ghosting marks that are sometimes left when graffiti is removed that a lot of other contractors will struggle to remove. On very stubborn graffiti or when working on delicate surfaces we will use an environmentally friendly, non-hazardous chemical or an abrasive with our wet blasting kit. This enables us to cover graffiti removal on any surface using just one machine. We are well informed by our customers that if graffiti isn’t removed quickly and shortly after it has happened then the number of tags and other graffiti that follows is massive - covering all walls spaces in a very short amount of time. In most cases removing it straight away normally prevents others putting their tag next to the ones already there. With this in mind we can also supply or apply Anti Graffiti Protection coating where graffiti is a risk factor, this will enable easy graffiti removal should the problem re-occur. Graffiti removal equipment and chemicals can also be supplied should you wish to tackle the job yourself. There is often confusion about the spelling of GRAFFITI, the most common misspelling is GRAFITTI.